CSUSB’s Women’s Volleyball team was in the biggest fight of the season taking on the four-time national champions, Concordia-St. Paul, but ultimately met defeat at the hands of their bitter rival yet again. However, the atmosphere at CSUSB’s Coussoulis Arena was electric for the final, from the moment the Lady Coyotes stepped foot on the floor, fans let Concordia know whose turf they were in. Having been undefeated in the Coussoulis Arena for more than 32 games entering this championship, CSUSB fans had a reason to cheer. The bleachers were packed, the crowd elbow-to-elbow with few seats open, even in the nose-bleeds. Many others lined the rim of the arena to watch. These fans showed so much dedication it was like they were the seventh man on the court. Unfortunately, the Coyotes were defeated in three games with a score 25-20, 31-29 and finally 25-18 making Concordia-St. Paul national champions for the fifth consecutive year. However, the Coyote’s fought hard and made Concordia work for each point. The fans cheered on, never giving up hope as they stood on their feet during the majority of the last two games. Mark Hartley, director of student leadership and development at CSUSB often rallied the troops, running on the sidelines getting students and fans to their feet to cheer on the lady Coyotes. Fans were high-fiving each other and collaborating in the stands to come up with different cheers to motivate the Coyotes. Constant positivity was channeled to the CSUSB team, clapping even when a mistake was made to keep their spirits high. Coming off of a spirited win just days earlier, the top-ranked Coyotes played their first five-set match of the season and their first inside their home arena since 2007 on Dec. 1 in an epic 25-19, 23-25, 22-25, 25-20, 15-6 thriller over visiting Hillsdale at the NCAA semifinal. Again having previously beaten other heavyweights such as Flagler and passing through Regionals unscathed the Coyotes seemed ready for their rival match-up. However, Concordia held their ground and showed why they were defending champs despite CSUSB’s best efforts to dislodge their opponent. For Box scores and match stats visit CSUSB Athletics. Yet again the Lady ‘Yotes showed just how far they could go and embodied and inspired the drive and spirit of students at CSUSB. For more about school spirit at the final read the attached commentary below. Students attending the match should not only be proud of their nationally ranked Coyotes but also be proud of themselves. In the three years that I have attended this school, I have never seen as much enthusiasm and support than I did tonight, or the past three nights as we hosted the NCAA Division II National Volleyball Tournament. I felt like I was a part of the game; that the team needed the rest of us standing behind them as a force. This is what CSUSB has needed. Thanks to our successful team, CSUSB has been given a chance to reignite school spirit and move past the commuter stigma. It shouldn’t be about Greeks, certain sports teams, or the major you’re in because from what I have seen tonight, we are a united force fighting for one common purpose. School spirit doesn’t begin with the school, it begins with the students and the dedication they have. We have certainly seen that these past three nights. Thanks again to the Women’s Volleyball team and good job on the season. Thanks also to those who came to support. Hopefully, this momentum continues. Immigrants shouldn't be deemed "illegal"
Good job Cal St San Bernardino, however as for the write-up on the match between Concordia and CSUSB should’ve been better. Sure it was good to know how excited the crowd was before the match, the score and the history(herstory) between these two top notched Div II volleyball teams. What is missing is who was the hottest player for Concordia, how did Concordia dismantle CSUSB on the very last match of the season, who did Concordia scout out to take CSUSB out of their game, what was CSUSB’s mind set after losing set one, did you or someone else ask if any of the Coyote’s players were focused, having doubts in their minds, or where their will power is to overcome two sets to zero. Moreover in this match which CSUSB player was on, which one had their game face, which player suddenly was having an off night, did you go to CSUSB and listen to what Coach Cherniss was saying to the team during a timeout? These were some things that are usually reported in a sports article, however what Cook just reported is good – something to trigger up good memories for that night and most of all it’s like a filler during prime time during the summer Olympics. 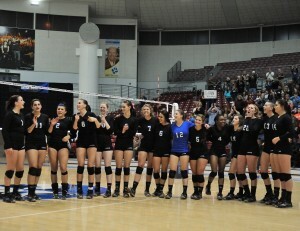 Now getting back to the CSUSB volleyball team – not a good job, but a very, very good job in having another great year. Way to go team, coach and staff. In the future we will definitely consider your advice, Miss Cook completed her assignment to our expectations. At the time of publication of this article we, the Chronicle, are actually out of production, so this coverage was a nice bit of citizen journalism; more blog like if you would. For more about the specifics of the match we refer you to csusbathletics.com. Here we we’re seeking to shed light on what we though our readers would want to see. Thank you.